When your child has special educational needs (SEN) it feels like there is an even greater weight to getting the right school for them. Many children with SEN can attend regular mainstream schools and have their needs met well there. Both our boys have an ASD diagnosis but only one is in a mainstream school. Our eldest son positively blossoms in this setting. So what can I share about getting him a mainstream school? Whether it's via the final or draft EHCP or it is based on medical, therapy and psychological reports, start by getting an understanding of what your child's educational needs are. What extra support will they need in school either to access education or maybe for emotionally well being. Lots of people assume that as you get to 'pick' the school for your SEN child if they have an EHCP that you will just pick the best performing school in the area. This may be your final choice but don't assume the 'best' school in the area is the 'best' one for your child. Look at your child's SEN and think about what suits them. Would a smaller school be better? Is outside space really important? Or is natural lighting important. What about access? Drop off? School experience with areas of your child's needs? We'd like every school to have everything. It's a bit like buying a house though. We'd all like lots of bedrooms, and a big garden, and a garage and a drive etc etc. But there are things we would like to have, and things we need. Which things at school are most important to your child? For example, we really wanted classrooms that were physically bigger so Anthony always has some space and didn't have to climb over kids to go in and out the class. Seems like a small thing but it could make a big difference if it's important. The Special Educational Needs Coordinator or SENCO, will probably be responsible for developing the school’s SEN policy to make sure all children get appropriate support and high quality teaching and coordinating all the provision for children with special educational needs or disabilities (SEN). You will be working with this person, so meet them and see how they work. It's worth baring in mind that not all schools have a full time SENCO as it depends on their needs. What we liked is someone who at least appeared organised, knowledgeable and above all seemed to care. A school has to take a SEN child if they are the school named in the child's EHCP, but only if they can meet the child's needs and it won't affect the safety or learning of other pupils. This means they can turn you down. One of the 'best' schools around us pretty much told us they would object to our son coming. As every school is different not all mainstream schools can meet the needs of every SEN child. They have a responsibility to do all they can to meet your child's needs with support from the borough but sometimes they just can't. Some have break out rooms for small group activities, others don't have for example. Finally, if a school is full, you could have to wait for a place. You can't turf another child out of school for yours. That's obviously unfair. What, but I'm talking about mainstream? Everyone's initial preference should be for mainstream if it is suitable. It's inclusive and gives children a greater possibility of functioning in society sooner. Looking at units, however, is a great way to think about what the other schools offer in comparison. What bits about the units do you or don't you like and how are these characteristics represented in the mainstream schools. And what if mainstream schools can't meet the EHCP requirements? Then at least you have an idea of alternatives. I know it's a big decision. The more information you have the better. Ultimately you know your child best so you are the best person to decide where they will be happiest and most productive. 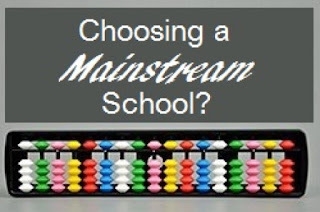 If you've been through choosing a mainstream school what advice would you pass on? Great post, will help many with their decisions I'm sure. I think there are some parents who see an EHCP as a way to 'choose' a school - this was said to me when our girl got hers - but you come to realise that the choosing bit is not all that easy... This will at least help parents to get think more broadly before visiting schools.